To view the artwork on a smart board or with other computer projection aperatus click here. Repentance at the font of God’s mercy is at the heart of Christian discipleship. Yet how is an artist to depict the interior movement of a repentant heart that returns to God, who is rich in mercy? The parable of the prodigal son, recounted in Luke 15:11-32, offers a radical image of reconciliation between a repentant son and his merciful father. It evokes the interior journey of repentance in each one of us as we stand in need of God’s mercy and forgiveness. Countless artists have attempted to bring this biblical passage to life. Rembrandt van Rijn’s The Return of the Prodigal Son is, by far, one of the most evocative of these “visual homilies.” One cannot be left unmoved before this unforgettable image, permanently housed at the Hermitage Museum in St. Petersburg, Russia. Completed around 1668, towards the end of his life, the painting is the crowning achievement of Rembrandt’s remarkable artistic career. The Dutch master painter skillfully leads the viewer from the details of the story into the heart of its theological and spiritual meaning. He also conveys, with his masterful brush in subtle color and fine chiaroscuro, several profound themes that catechists and teachers will find particularly relevant and inspiring. To reflect on a masterpiece of biblical art requires a prayerful reading of the Sacred Scriptures that inspired it. In the fifteenth chapter of Saint Luke’s Gospel, Jesus recounts three parables to an assorted group of Pharisees, tax collectors, and sinners. The simple joy of finding what once was lost—a stray sheep, a valuable coin, or a wayward son—is the thread that ties these parables together. Through a cascade of biblical images, the human experience of deep joy, as the fruit of unconditional love, comes to life. The restoration of lost dignity is elevated to a profound “teaching moment” by Jesus, the One sent by God to seek out lost humanity and restore fallen humanity to its original dignity in the loving arms of his merciful Father. Rembrandt’s image goes beyond any one particular moment in the parable. In what might be called a “simultaneous narrative,” various moments in the unfolding story are presented, all at once. The reconciliation of father and son stands still in a timeless moment that transcends the individual events in the story. With each masterful stroke of his paintbrush, Rembrandt delivers a stirring “visual homily” that breaks open the Word of God even today. Three figures appear prominently in the foreground of Rembrandt’s scene, considered by renowned art historian, Kenneth Clark, to be “the greatest picture ever painted.”[i] On the left, the elderly bearded father, clothed in rich tasseled robes of red, and his disheveled son, in tattered garments, reunite in a tender embrace. On the right, a large imposing figure towers over them, thought by several critics to be the older son. He too is clothed in rich red robes and he appears to wring his hands in displeasure. His disapproving eyes look down on the unfolding reconciliation, while three onlookers painted in background shades of fading light, gaze at the poignant scene unfolding before their eyes. One of them raises his right hand over his chest, indicating perhaps surprise, curiosity, or remembrance of past experiences. By presenting a triad of figures in the foreground Rembrandt reminds us that this parable is as much about the unconditional love of a father for his wayward son as it is about the reconciliation of an entire family, wounded by the selfish sin of one of its members. The prominent space allotted to the older brother is a cue that both sons have lost the dignity of their common sonship. The prodigal son was lost, in an obvious way, through his life of reckless decadence and degradation; but the older brother’s sonship was also diminished, through the not-so-obvious sin of smug self righteousness that makes a heart, slowly but surely, grow loveless, harsh, and cold. “Father, I have sinned against heaven and before you; I am no longer worthy to be called your son; treat me as one of your hired hands.” With these words the younger son acknowledges his sinfulness and expresses remorse for the many wrong choices that led to his utter debasement. One can only imagine the Pharisees and Jewish listeners of Jesus’ words recoil in disgust at the thought of the prodigal son yearning to eat food given to pigs! His shame and degradation are evoked by his torn clothes, worn sandals, and dirty half-shod feet. His words also express his sense of justice as he returns home. He does not expect to be treated well or even considered worthy to be called a son. His only hope is to be received back into the household, as a lowly servant perhaps. He brings with him only the logic of human justice and reparation in the face of his wrongdoing. The older son, from his comfortable perspective, holds an even stronger sense of restitution and fairness. Rather than welcoming his brother with joy, he looks only to himself as the one who was “wronged.” After all, he was faithful for many years and never received so much as a goat to feast on. He condescendingly looks down at his father’s outpouring of mercy and is indignant. His sense of justice kindles into a flame of jealous anger. The forgiveness of the father, bent over in mercy, flows down the gentle slope of his shoulders to his tender yet strong hands that enfold the prodigal son. A warm golden light radiates from his old face and bowed frame. His bearded face is softened with overflowing joy for his wayward child’s return home. Rembrandt’s masterful use of warm light surrounding the father and repentant son should evoke, in any viewer, deep gratitude for the father’s mercy that welcomes, forgives, and reassures. For who among us would not be grateful to find such forgiving tenderness after so much selfish infidelity? The father’s actions transcend the all too human logic of justice and rightful reparation for wrongdoing. Now mercy is stronger than justice. And love alone restores lost dignity. The sharp contrast of light and shadow is a masterful example of chiaroscuro, and it conveys the spiritual reality that unfolds each time the darkness of sin is overcome by the light of divine mercy. Rembrandt’s image also highlights the spiritual drama that unfolds when divine forgiveness is mediated through the ministry of the Church, particularly in the Sacrament of Confession. Both sons represent humanity lost through sins of self-love and self-righteous pride. The father embodies the love of God, our heavenly Father, who reaches down to lost humanity in the person of his Son, Jesus Christ, to restore fallen humanity to its original dignity. We were created in beatitude to live in union and friendship with the Creator of the universe. Only by the redeeming Paschal Mystery of Jesus’ life, death, and resurrection do we return to that original God-given dignity, lost through sin. Only divine love can transcend human justice and restore our dignity as children of God. 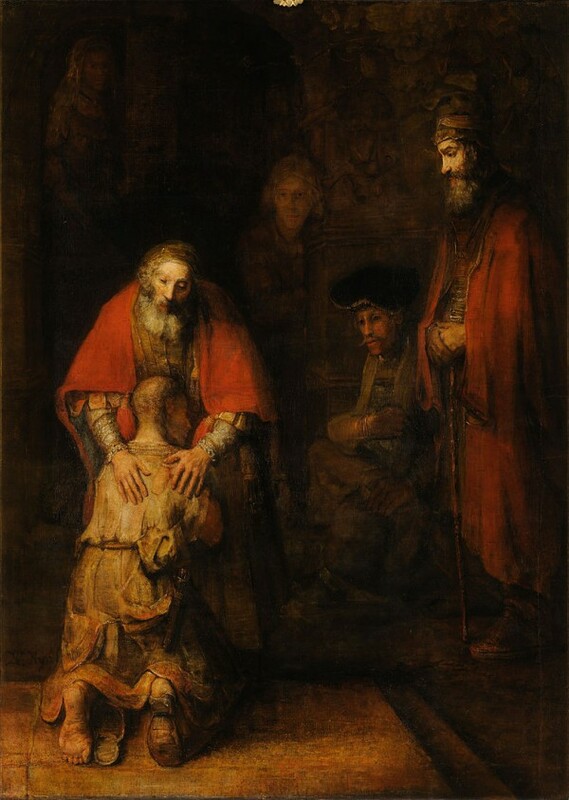 Rembrandt reminds us of the great dignity of sonship, restored to the prodigal son, as well as to you and me. As we ponder this masterpiece image, a prayer of praise should rise up in our hearts for the gift of faith that also opens to us, over and over again, the same unending mercy and healing love of God. Jem Sullivan, Ph.D., wife, mother, professor, and catechist, is the author of three books from Our Sunday Visitor, including The Beauty of Faith on Christian art and the new evangelization. She is a regular contributor of art essays in various Catholic publications and appears on ETWN to discuss masterpiece paintings from the National Gallery of Art, Washington, D.C., where she served as a docent. [i] Durham, John I. The Biblical Rembrandt: Human Painter in a Landscape of Faith, Mercer University Press, 2004, 183. Kenneth Clark quotation. This article was originally on pages 21-24 of the printed edition.